This talisman was created while the fixed star in the Heart of the celestial Lion was highly dignified in number of ways. The talisman of Regulus was made for increasing courage, luck, fortune, power, and more. HERE you can read more about the creation and amazing qualities of the Regulus talismans when made on the most appropriate celestial time. The talismans was made from 24 CARAT SOLID GOLD and 1000 (100% silver). The gem is natural untreated red wine TOURMALINE cabochon of large oval size approximately 19×15 mm. The magic symbols and characters of Regulus were engraved on the back/down side of the gem, so that they remain secret for the public eye, but will touch the finger. This ring is handmade and is a unique model made by famous Israeli jeweler. The gem is natural untreated red wine GARNET cabochon of large oval size approximately 15 mm. The talismans was made from 1000 (100% silver) and the small garnet is surrounded by solid 24 carat GOLD. The gems are two natural untreated red wine GARNETS cabochon of oval size approximately 14 mm and a small garnet of approx. 2mm. The magic symbols and characters of Regulus were engraved on the back/down side of the talisman, so that they remain secret for the public eye, but will touch the finger. The talismans was made from 1000 (100% silver) and the dots are from solid 24 carat gold. The gem is natural untreated red wine GARNET cabochon round size approximately 14 mm. The talismans was made from solid 24 CARAT GOLD and sterling silver. The gem is natural untreated red wine GARNET cabochon round size approximately 15 mm. The gem is natural untreated red wine TOURMALINE cabochon of large oval size approximately 18×15 mm. The talismans will be made from 24 CARAT SOLID GOLD and 1000 (100% silver). The gem is natural untreated mandarin very rear SPESSARTINE GARNET of approximately 9×9 mm size. The gem is natural untreated very rear MANDARINE SPESSARTINE GARNET of very large approximately 17×13 mm size. The gem is natural untreated RUBI of large size approximately 10×10 mm. The talismans was made from 18 CARAT SOLID GOLD. The gem is natural untreated RUBI of approximately 12 mm size. Please note that the ring may appear a bit larger on the picture than it actually is. This ring is handmade and is a unique model made by famous Bulgarian jeweler. The gems are natural untreated RUBIES of approximately 12 mm size. This talisman is handmade and is a unique model made by famous Bulgarian jeweler. The talismans was made from 24 CARAT SOLID GOLD (the house of the gemstone) and 18 KARAT SOLID GOLD (the round ring). The gem is natural untreated HESSONITE GARNET of approximately 12×10 mm size. The size of the ring is fixed 7,3 – 8. The talismans was made from 24 CARAT SOLID GOLD (the house of the gemstone) and 18 KARAT SOLID GOLD (the hook). The gems are natural untreated HESSONITE GARNET of approximately 12×10 mm size. Please note that the talisman may appear a bit larger on the picture than it actually is. This talisman is handmade and is a unique model made by famous Israeli jeweler. The talisman pendant was made from 24 CARAT SOLID GOLD (the house of the gemstone). Please note that the talisman may appear a bit larger on the picture than it actually is. Therefore, look at the size given. The bracelet was hand made in Holland from from SOLID 14 CARAT GOLD and hand cut natural RHODONITE GARNETS of red wine color and was turned into a powerful Regulus talisman by me following the very ancient Babylonian tradition of astral magic. It was hand made in the 1800s and the garnets are originally from a Czech mine. These are authentic rhodonite garnets of a very good quality. The bracelet is 20 cm approximately long and the garnets are of approximate size 3-4,5 mm. The magic symbols and characters of Regulus were engraved on the back/down side of the locker of the talisman, so that they remain secret for the public eye. The bracelet was hand made in Holland from from SOLID 14 CARAT GOLD and hand cut natural ALMADINE GARNETS of red wine color and was turned into a powerful Regulus talisman by me following the very ancient Babylonian tradition of astral magic. It was hand made in the 1800s and the garnets are originally from a Czech mine. These are authentic ALMADINE garnets of a very good quality. The bracelet is 18,5 cm approximately long and the garnets are of approximate size 4,5-5 mm. THIS REGULUS TALISMAN WILL BE AVAILABLE IMMEDIATELY AFTER CONSECRATION ON 12.05.2019. The talisman of Regulus will be made for increasing courage, luck, fortune, power, and more. On that day the royal fixed star Regulus will be highly dignified. HERE you can read more about this. The bracelet was hand made in Holland from from sterling silver and hand cut natural ALMANDINE GARNETS of red wine color and will be turned into a powerful Regulus talisman by me following the very ancient Babylonian tradition of astral magic. It was hand made in the 1800s and the garnets are originally from a Czech mine. These are authentic almandine garnets of a very good quality. The bracelet is 17,5 cm approximately long and the garnets are of approximate size 5 mm. The magic symbols and characters of Regulus will be engraved on the back/down side of the locker of the necklace, so that they remain secret for the public eye. The bracelet was hand made in Holland from from sterling silver and hand cut natural RHODOLITE GARNETS of red wine color and was turned into a powerful Regulus talisman by me following the very ancient Babylonian tradition of astral magic. It was hand made in the 1950s and the garnets are originally from a Czech mine. These are authentic RHODOLITE garnets of a very good quality. The bracelet is 18-18,5 cm approximately long and the garnets are of approximate size 3-4 mm. The pendant was hand made in Greece from sterling silver and natural RHODOLITE GARNETS placed on MOTHER OF PEARL white bed. It will be turned into a powerful Regulus talisman by me following the very ancient Babylonian tradition of astral magic. The pendant approximately is 4 cm approximately long. The beautiful handmade Greek necklace is included. The pendant was hand made in a rose shape in Greece from sterling silver and natural RHODOLITE GARNETS. It will be turned into a powerful Regulus talisman by me following the very ancient Babylonian tradition of astral magic. The pendant approximately is 5 cm approximately long. The pendant was hand made in a daisy shape in Greece from sterling silver and natural RHODOLITE GARNETS. It will be turned into a powerful Regulus talisman by me following the very ancient Babylonian tradition of astral magic. The pendant approximately is 4,5 cm long. The pendant is antique from the Victorian 19th century Britain. It is made from sterling silver and natural RHODOLITE GARNET. It will be turned into a powerful Regulus talisman by me following the very ancient Babylonian tradition of astral magic. The pendant is approximately is 2-2,2 cm long. The silver necklace is included. The necklace is 43-44 cm approximately long and the garnets are of approximate size 4,5-5 mm. 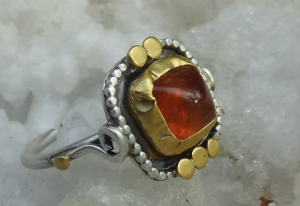 The talismans was made from 925 sterling silver and perfectly cut natural GARNETS. The silver necklace is with perfectly cut garnet stones handmade by the famous silversmith Olof Pettersson during the 1980s and will be turned into a powerful Regulus talisman by me following the very ancient Babylonian tradition of astral magic. The necklace is 42.5 cm (16.5″) long and the section set with garnets is 7.5 cm (3″) long. The largest garnet flower is 1.5 cm (0.6″) in diameter. The magic symbols and characters of Regulus will be engraved on the back/down side of the necklace, so that they remain secret for the public eye.